There are certain types of games for me that only come a handful of times throughout a generation. Titles like the acclaimed Journey, the haunting Limbo, or the terrifying Inside say so much without uttering a single word. Not only that, but they send chills down your spine with their artistic beauty and moving soundtracks. 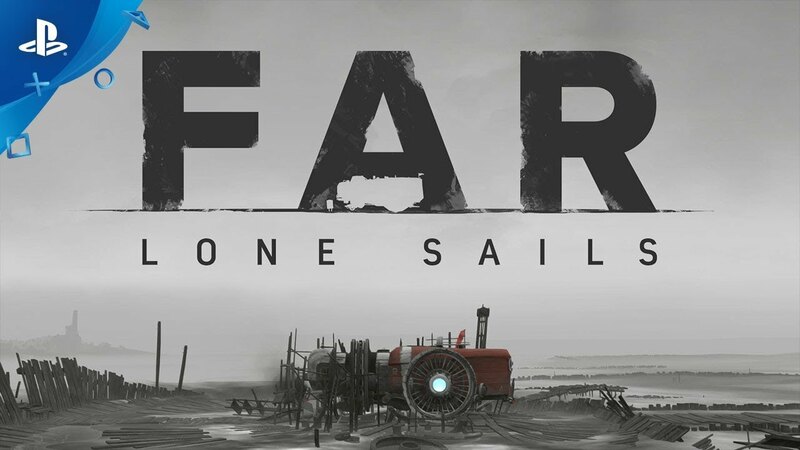 When I first saw FAR: Lone Sails, I had hopes that this title would be the next game to leave that kind of mark on me, one that I will carry far into the future. So, did it make the cut, or did this journey across a dried out ocean leave me feeling like it was too shallow? Let’s find out. FAR: Lone Sails never once says a single word throughout its 3-4 hour story (shorter if you rush, but I took my time). That being said, it doesn’t need to, thanks to some truly excellent visual storytelling. You begin standing over a grave beneath a dead tree. Your character’s face is obscured by a crimson scarf and a matching outfit. After a brief moment of reflecting, you take control and head off towards your house. Even in these opening moments, a keen eye can spot several clues and worldbuilding elements. That being said, it’s easy to pass right through the house and never spot them at all. Only once throughout the adventure was there a moment where you could tell the developers wanted you to see the images in the background (because they were important to the overarching story). If you wanted to simply run through this world and speed across the dried out ocean it offers, you can do that. In fact, one trophy asks you do finish the game in 99 minutes. It sounds easy, but as you’ll soon find out, this journey has higher stakes than most other titles in the genre. Once I reached the end of my first playthrough, I reflected quietly as the final scene played out. As everything faded to black, I started piecing everything together. I did the thing we all do and went to forums to look for theories, and then I started the game over again. I stood in that opening area and took my time looking through the house. All of it fell into place, like a self-solving jigsaw puzzle. It was a moment of beautiful revelation, but also an emotional connection for me as I suddenly found myself relating to the events of the game. It’s not the kind of story that immediately brings a tear to the eye, but it is one that strikes melancholy into your very bones when it begins to sink in. Needless to say, I really enjoyed it, and it’s the kind of story that will absolutely stick with me. Once you have control of your ship, which utilizes an engine, wheels, and eventually a massive sail to move across the dried ocean floor, you’ll need to keep it fueled and intact for the entirety of your journey. The various mechanics of the ship are all denoted with bright red buttons, while the health of the individual sections is displayed organically with meters and symbols in the ships interior. The cross-section view you get when you’re inside offers a perfect view of the ship at a glance. When you leave the ship, you’ll see the gorgeously detailed exterior, which makes for some truly breathtaking screenshots as your riding a strong wind across the landscape. Despite the lack of an ocean to sail upon, your ship moves with a grace that would put any sailboat to shame. I really loved how the game took a minimalistic approach to everything. There’s no real UI to speak of, and everything you need to know is displayed visually in your ship or the world. For example, you’ll come across numerous obstacles or pit stops in the game world that give you a new upgrade or ask you to solve some simple puzzles to proceed. When you first get your sails, you’ll notice a wind flag on the top of the ship beside the button that deploys said sails. When that flag is going, you can put the sails up to coast on the wind, but the game never tells you that outright. Even so, when you hear the wind blowing and you see that flag flapping in the breeze, you know it’s time to ride the invisible current. All of it feels so natural that I imagine most gamers won’t ever realize how much effort went into making the design this functional. Think about it, Far: Lone Sails never once forces it mechanics down your throat, and yet, you’ll pick it up like it’s a favorite from your past. It’s nuanced in its visual storytelling, but also in its visual design. Other neat mechanics include the ability to put out fires and repair parts of the ship, but I’ll leave the rest for you to figure out. There are plenty of little things that I really enjoyed figuring out (including a great way to store fuel that I’ll let you figure out). While I never ran out of fuel, there was a cool moment when I realized I could burn just about anything in the engine to keep it going. I remember sputtering to a stop in the middle of the night. There was nothing in sight but the starry sky. I went up to the bedroom area of the ship and saw my lamp hanging from the ceiling. It was a longshot, but I took it down and threw it into the engine. To my surprise, it worked! Moments like these are plentiful in FAR: Lone Sails, and when you combine them with several harrowing set pieces (one of which gave me my only game over), it’s easy to see how this title rises above the more relaxed gameplay of its contemporaries. I did run into one small issue when I experienced the aforementioned game over. The game took me back to the beginning of the scene before, resetting about 20 minutes of progress. I pulled up a gameplay video of the same moment and saw another player die and spawn just before the moment in question. I’m not sure if it was a glitch or if the checkpoint on the PS4 is intended to be that far from the scene in question, but it did put a damper on the experience as I had to repeat a lengthy part over again before I could attempt the scene I wanted to complete a second time. Despite this, by the end of my journey, I felt like I had become one with the ship. We were bonded through our struggle and it was bittersweet to leave it all behind as the credits rolled. Fans of the titles I mentioned in the beginning of the review would be insane not to check out FAR: Lone Sails, but honestly, this is a game for everyone. Not only does it offer nuanced storytelling and a wonderful world to explore, but it also caters to all skill levels and presents a masterclass is game design using visuals to explain mechanics. For the asking price, I cannot recommend it enough. That being said, I have more to say if you’ll indulge me a little longer. FAR: Lone Sails presents its shattered world in a style that has the look and feel of a painting in motion. Subtle details in the colors and textures mimic the feel of brush strokes when you look closely. The play between dilapidated greys and rich colors on the ship and in the horizon during sunrises is sublime. Honestly, there were several moments where I wanted to pause the game, take a screenshot, and frame it in my living room. It truly is a breathtaking spectacle to behold. We must also discuss the soundtrack. Composer Joel Schoch has a bright future ahead of him, as this is easily one of the best game soundtracks I’ve ever heard. Not since Nier: Automata have I heard such an eclectic mixture of instruments in a single collection of tracks and it work so incredibly well. Schoch brings together powerful strings with splashes of brass, haunting piano melodies, and some of the best (and only) tenor saxophone I’ve heard in a video game. There’s a track for every moment, be it the quiet reflection of a desolate wasteland, or the thundering beat of hail raining down upon your ship as the collisions seem to almost match the track itself. It’s a soundtrack that captures just as much, if not more, emotion than the game itself. The highest compliment I can pay the composer here is that this sounds like an Austin Wintory soundtrack (the composer for Journey and several other games). Honestly, I was shocked when I looked at his credits and saw so little recognition for his work, especially in gaming. It is my firm belief that we will see his work again in gaming, and I for one cannot wait to see what comes next. FAR: Lone Sails is one of the best games I’ve played on the PS4. It may not have the budget and scope of something like God of War, but it has all the trimmings of an indie classic. I loved everything about it, from the stellar art, to the utterly incredible soundtrack, to the organic and effortless design. I would have loved it to be longer, and the puzzles could have put up more of a fight, but there’s not much more I can say about FAR: Lone Sails than I’ve already said. Do yourself a favor and add this wonderful game to your library. You won’t regret it.